The latest world rankings were announced by the BWF on June 6:The world number one for the various disciplines were:Men’s singles-Lee Chong Wei (Malaysia), women’s singles-Li Xui Rui (China), men’s doubles-Ahsan／Setiawan (Indonesia), women’s doubles Bao Yi Xin／Tang Jin Hua (China), mixed doubles-Zhang Nan／Zhao Yun Lei (China). 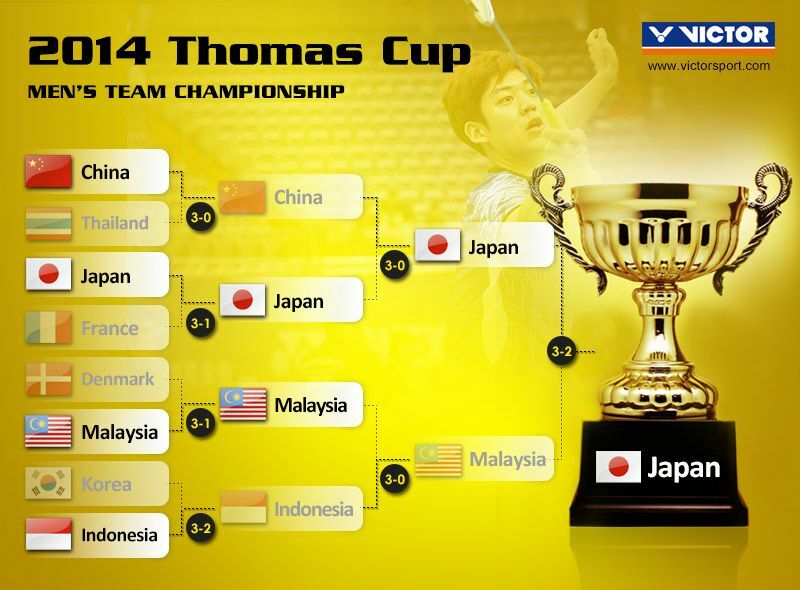 Also, popular Lee Yong Dae made a return to competition in the Thomas Cup in May. At present, Lee and his partner in the men’s doubles, Korea team captain Yoo Yeon Seong, rank 6th in the world. The Thomas Cup and Uber Cup in May are the biggest international badminton tournaments this year. The winning team didn’t just win glory, the team members also bagged a large number of ranking points that helped them move up the rankings. In the 27 Thomas Cups held so far only three teams have won the title;Indonesia have taken the title more than any other country (13 times); China has been dominant over the last decade and more, winning seven times 1998-2012;the other country that has won is Malaysia, however,they have only won five times, and the last time was 22 year ago (1992). It is certain that commentators were very surprised to see Japan and Malaysia in the final this year. The two teams played well, presenting an exciting spectacle for fans, with three of the finals going to three games, showing how closely matched the teams were and how determined both were to win. It was give and take throughout, with the winner only decided at the end of the last singles match when Japan’s Takuma Ueda narrowly overcame Daren Liew of Malaysia 21-12,18-21,21-17, in doing so shattering the Malaysian team’s dream of winning the title again after 22 years. India takes its first Uber Cup medal! The host country India had never won a medal in the Uber Cup before so were not fancied to do well this year. However, the Indian players were clearly determined to put on a good show in front of their families and home fans and managed to convert this determination into concrete results. They reached the quarterfinals as top of their group after winning all three qualifying matches;they whitewashed Indonesia 3-0 in the quarterfinal; facing one of the fancied teams, Japan, in the semi-finals they went down 2-3 but did themselves proud and put on a thrilling show for home fans. The Indian players that surely left fans with the deepest impression were Ashwini Ponnappa and her women’s doubles partner Jwala Gutta. ; the pair played flawlessly and did not drop one game in the qualifying matches and quarterfinal. They did lose to Misaki Matsutomo／Ayaka Takahashi, a pair far ahead of them in the world rankings, in the semifinal but they played brilliantly and made the Japanese really work for their win, harrying them to the deciding game, and at one point actually leading 9-5; they came very close to taking India to the final and sent the fans wild with excitement for a time. Ashwini Ponnappa／Jwala Gutta rank 23rd in the world at present. It is to be hoped that they continue to perform well in coming tournaments and they move up the rankings. Upcoming major international tournaments are: the Japan Open (June 10-15), Indonesia Open (June 17-22) Australian Open (June 24-29); these three BWF Super Series tournaments in succession will be a test of endurance for players but the ranking points available are worth the effort. Want to know which famous players will play in these tournaments? For more international badminton news, keep a close eye on VICTOR’s official website.